Gov. 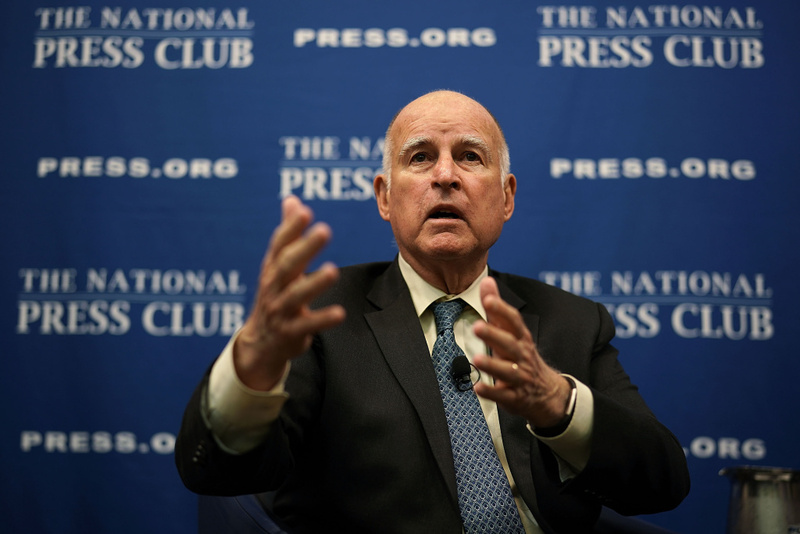 Jerry Brown speaks during an event at the National Press Club April 17, 2018 in Washington, D.C. Governor Jerry Brown has until Sunday to decide whether to sign or veto any legislation that remains on his desk from the most recent legislative session. Some of the notable bills still waiting for a signature on the line which is dotted include a bill that would reinstate net neutrality at the state level, one that would ban smoking in state beaches and parks, and another that would prohibit businesses from forcing their employees to sign arbitration agreements. Among the bills Governor Brown has already signed include one that legalizes street vending statewide, one that allows meals cooked in private residences to be sold, a ban on full-service restaurants handing out single-use plastic straws if one isn’t requested and, of course, the controversial bill that allows public utility companies to pass along liability incurred from wildfire damages to ratepayers. He has vetoed several bills as well, including one that would have mandated no middle or high school begin classes before 8:30 in the morning and one that would have prohibited signature-gatherers for election ballot measures from being paid per signature collected. We’ll round up the major legislation that’s been signed and vetoed, and what’s still waiting for a John Hancock from Governor Brown. No tipping was all the rage a couple years ago, but how sustainable is the trend?